In 1981 The Three Marias Co., comprised of Maria Petrish, Marija Anderson and Maria Franulovich, purchased the former church and announced plans to renovate it. The lte George Franulovich had dreamed that something would be built in Anacortes to show that the Croation people had been here. 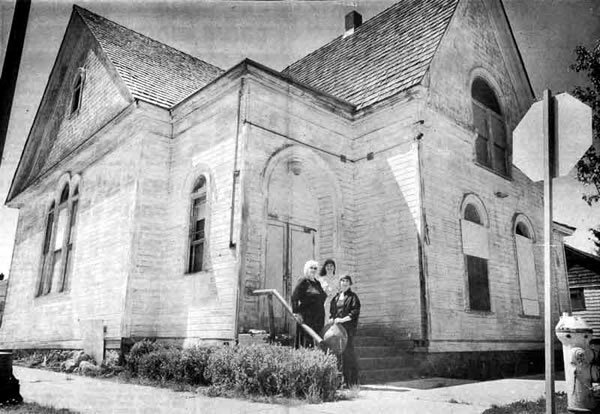 In the old picture, Maria Franulovich, Marija Anderson and Maria Petrish stand in front of what was to become the Croatian Cultural Center at the Little Church in a photograph from the 1980's. The newer picture was taken after the church's extensive rehab. The City of Anacortes declared the building a landmark building in 1983 in this letter signed by then city Planning Director Ian Munce. The Little Church was originally built as a Presbyterian Church in 1891. When the Presbyterian congregation outgrew the building, it was sold in 1923 to the Skagit County Evangelical Society, which sold it in 1927 to the Assembly of God Church, which in turn sold the building to the Veterans of Foreign Wars in 1936. In recent years the building has served as a storage facility. The first regular minister in Anacortes was Reverend A. S. Foster, who arrived in 1889. The congregation first met in Amos Bowman's residence, moving later to a canvas-roofed frame building on Tenth Street. For a short time the congregation met then in Child's Hall at the corner of Third and "R" Streets, 'and in January 1981, moved into the Bowman Opera House. In May 1891, our building was completed at a cost of $2,600. The Presbyterian Church is significant for being the oldest surviving church building in Anacortes. With the exception of the loss of the large corner tower, the building is intact as built and is a good example of a nineteenth century, eclectic building type. This building serves as a prominent visual anchor on the east side of the historic commercial core of Anacortes. -Source: Historic Property Inventory Survey done in 1987.